Dark Horizon, hailing from Italy, are back with their second album. Only the keyboardist and one of the guitarist remain from the debut, Son of Gods. Therefore, this is basically a new band, but the music is much improved over their debut. I can't say that this is anything that will tear up my stereo for the next few months, but it is an enjoyable release. Compared to many of the metal bands from Italy trying to make a career, Dark Horizon is a solid second tier band. 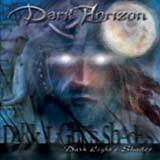 Dark Horizon is playing symphonic power metal, with progressive overtones. The compositions range from fast, double bass fueled to the more melodic, mid tempo tracks with progressive breaks. With the exception of the intro and the last two tracks, all songs are in the 5 to 6 minute range. What this does is allow the band to inject some progressive elements into their songs, with flying off aimlessly on a tangent that puts the listener to sleep. You won't hear 7 minute guitar or keyboard solos, nor will you be subjected to time change after time change that serve no purpose other than show how complex the band can play. Each song is fulfilling, flowing nicely into the next. The keyboards are an ever present element to the sound. However, I do think that the band was too generous in the mixing room in regards to the keyboards. At times, the keyboards dominate the sound, covering up the guitar work. I understand that this is an important element of the sound, but the riffs are certainly the driving force behind the songs, and should be at the forefront. Acoustic passages and flute accompaniments are also spread throughout the album. Each of the songs have a nice, but not overplayed sense of melody. Vocalist Roberto Quassolo is able to play into this with his melodic and emotional voice. On the other hand, I feel that his delivery is too nasal for the majority of the album, severely reducing his power and range. When the songs seem to call for a powerful belt, the vocals seem to fall a bit flat due to lack of power and thinness. I can't take away the fact that Roberto puts his heart into his singing, though. He is a serviceable vocalist for this music, as you'll never hear him fall out of tune or make a mistake. Additional power and a less nasal delivery could really bump the songs up to a new level. The riffing and rhythm section are very strong and tight, sounding like the work of veterans of the metal scene. As I said before, there are plenty of catchy and well played riffs to be heard, but sometimes they are overshadowed by the keyboards. The drum work is solid, providing a steady and thundering backbone for the sound when needed, while also demonstrating creativity along the way. There are a small number of programmed drum loops sprinkled throughout. I really could have done without this, in favor of the drummer playing the parts himself. This is really a minor complaint, as these instances are few enough that they don't interfere with my enjoyment of the album. The overall sound quality of the album is excellent, another substantial improvement over the debut album. Sascha Paeth mastered this CD in his German studio, so that is no surprise. While each of the band members brings talent to the table, the band still has room to grow. There are many good songs on this album, however none really stand up as a true killer track. This is the type of album that comes and goes without getting boring or grating your ears with mistakes. However, this is also the type of album that is nice to listen to, but lacks climatic or killer moments. As I said before, the vocalist gets the job done well enough, but I feel that he does miss the opportunity to add some climatic moments and character to the songs. Despite the heavy turnover in the lineup, Dark Horizon has managed to improve upon their debut album. In my eyes, that's a great accomplishment for this band. Still, this is a second tier release, but some growth in the songwriting department and tweaking of the lead vocalist's delivery could see the band jump up the ranks in the future.